ISBN 9790006482887. 9x12 inches. Key: G major. 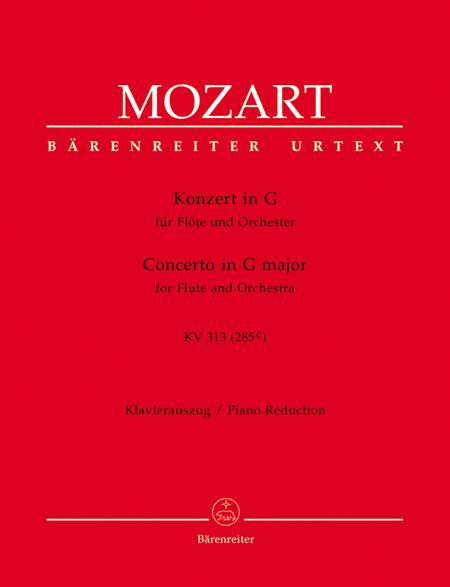 The new Barenreiter piano reduction of Mozart's G major flute concerto offers not only a clearly laid out reduction with page turns where players need them, but the results of years of scholarly research combined with the know-how of some of the most important performers and teachers today. In the solo flute part all tutti passages are presented completely in large print as found in the sources. Emendations by Franz Giegling , editor of the New Mozart Edition volume, are indicated typographically so players can clearly see what has been added. This new reduction also provides a wealth of cadenza options; the first two movements each have FIVE new cadenzas to choose from. The renowned English flautist and teacher Rachel Brown has provided not only three cadenzas to each of the first two movements, but also TEN possibilities for the embellishment of the last movement fermata and theEingangfollowing it. 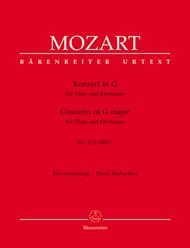 Complementing Franz Giegling's historical preface, Rachel Brown has written a lengthy text on performing cadenzas and specifically on how Mozart structured his own piano concerto cadenzas as a guide to structuring and improvising Mozart flute cadenzas. Additional cadenzas andEingangeare provided by the German flute player Konrad Hunteler and performance practice specialist Karl Engel. All in all, this new reduction is like nothing flute players have seen before: quality, reliability, comprehensiveness and good value! An excellent edition, which goes without saying, I suppose. Provided are the tutti sections in the solo score, as well as a selection of cadenzas for one to memorize. Clear, clean printing makes this definitely worth the money.